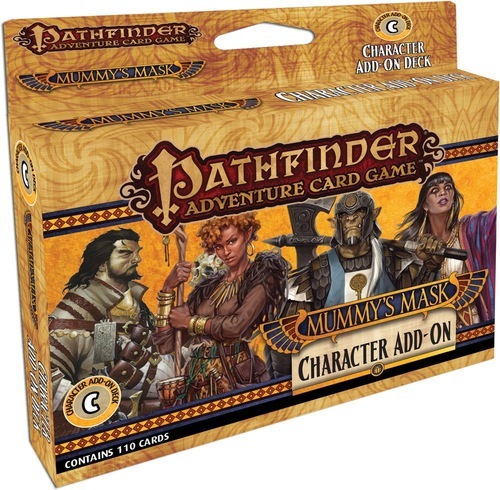 The Pathfinder Adventure Card Game: Mummy’s Mask- Character Add-On Deck is published by Paizo Publishing. It adds 4 new characters to the base game – Ahmotep the magus, Channa Ti the druid, Drelm the cleric and Mavaro the occultist. It also makes it possible to play the base game with 5 or 6 players. There are lots of new weapons, spells and items, as well as some of the most useful gear included. For more information on the base game and how to play it, please follow the link below. This expansion adds 110 cards to the original game. Much like the original game, the artwork on these is very nice. I especially like the looks of the new characters as well as several of the different monsters, obstacles and allies. The card designs are the same as those found in The Mummy’s Mask. I’m guessing that like with the base game, the art is most likely taken from the original RPG adventure. There are certain elements of this expansion that fit well with the theme, like the Camel. However, I’ve never heard of some of the things inside this deck and am not sure how they fit the theme. Still, I’m quite pleased with the overall look and feel of this expansion. There is no rulebook included with this expansion. Everything needed to use the cards in this deck are included in the main game. As I’ve mentioned in the review of the main game, I really like the Egyptian theme in this game. The cards in this add a lot of new challenges in the form of new monsters and obstacles. The new characters are very cool. I especially like the new half-elf druid included in this one. There’s also plenty of new gear included in the deck, as well as new magic and allies. I think that this expansion adds enough new material to round out the base game a little bit better. I think that most players will want to add this to the original game. It’s definitely worth having, especially for those just starting out the game. I enjoy this expansion a lot. It’s a must have, in my opinion. The Mummy’s Mask Character Add-On Deck is a must have addition to the Mummy’s Mask version of the Pathfinder Adventure Card Game. This doesn’t add any additional play time to the original game. However, it does make it possible for more players to join in on the fun. The artwork and design of these cards are great. I love the look and feel of them. Fans of the Mummy’s Mask set for the Pathfinder Adventure Card Game, will most definitely want to add this to their game. It’s a must have, in my opinion. I highly recommend this expansion. For more information about this and other great games, please check out Paizo Publishing at their site. 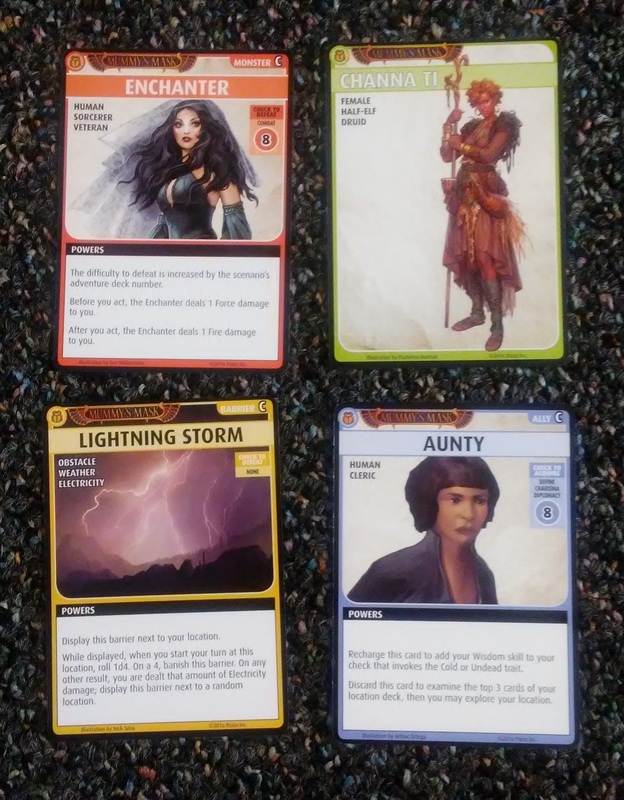 This entry was posted in Reviews and tagged add, add on deck, add-on, board, board games, card, card games, character, deck, games, mask, mummy, mummy's mask, on, paizo, paizo publishing, pathfinder, pathfinder adventure card game. Bookmark the permalink.